Participants in the Freshman Leadership Program made their way back to campus yesterday after a four day retreat in Maine. At least some of the freshmen arriving on campus aren't as new as one might think. The Freshmen Service Program, a freshman program run by the Department of Ocean Engineering, and the Freshman Leadership Program all gave some selected freshmen a sneak preview of the Institute. The pre-orientation program organized by the department of Ocean Engineering was the brainchild of J. Kim Vandiver PhD '75, a professor of Ocean Engineering. The program attempted to showcase one of MIT's smaller majors while introducing freshmen to the academic side of the Institute. The 30 freshmen participating built remotely operated vehicles (ROVs) and tested them on the open sea. "I didn't know anyone that didn't enjoy it," said Mary K. Thompson '02, a participant in the program. She said that on Monday the group "spent all day in lab" working in pairs to construct the ROVs that were the focus of the program. Thompson dubbed her ROV "Atilla the Hun." On Tuesday the ROVs were tested in the Alumni Pool to verify that they were watertight. Freshmen attached a camera to their ROVs on Wednesday and piloted them via a 30 foot tether off Charlestown "to look around," Thompson said. Thompson said that the "mentors were wonderful" and that "a lot of people are considering changing majors." Vandiver called the program a "great success" and said that the Dean's Office is looking at the program "as a prototype for much larger" activities of the same type. Vandiver said that the program was "fallout from chairing the Orientation committee" which recommended improving the way freshmen are introduced to the academic side of the Institute. "The faculty has long wanted to have more O[rientation]" during the first time freshmen spend on campus. This program, he said, will "give [students] a head start in adjusting to MIT before Orientation begins." In addition, the program provides exposure for Ocean Engineering. "Many students haven't had a clue what OE is," Vandiver said. This program "puts OE on the map." Vandiver said that he expects to repeat the program next year. 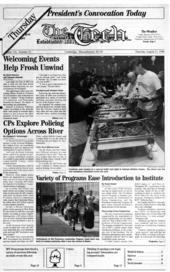 The Freshman Service Program is in its first year. Co-founder Ritu Gupta '99 said that the goal of the new program, which involved 46 freshmen, was to "develop a sense of community" with fellow students as well as with the Boston and Cambridge areas. She founded the program with Shawdee Eshghi '99. The program began with games and activities designed to explain issues that would be relevant to the groups work. The program then broke into "smaller more intimate groups" to participate in community service projects in Boston and Cambridge, Gupta said. Participants worked at the Boston Food Bank sorting food, at the Salvation Army, the AIDS Action Committee and the Thorndyke school. The program closed with a banquet attended by President Charles M. Vest and the Mayor of Cambridge. Presentations by the students really "opened our eyes to opportunities" in community service, Gupta said. Gupta said that "there were definitely quirks" in the program but said that FSP will "hopefully [be] established as an annual" activity. Freshmen from FSP and from the OE program were housed in East Campus, a decision which Vandiver said helped foster community. Now in it's third year, FLP is mature by comparison to other programs. The program received good review from the more than 100 freshmen who participated. "Even though I didn't have a great time [FLP] was the best way to start out my college life," said Michael H. Vogel '02. Vogel said he would "definitely recommend the program." Carlos A. Garcia '02 called FLP a "pretty good program" and "a very good chance to meet people during our first weekend here." FLP was "really good", said Jennifer E. Erwin '02, who pointed to the cross-dressing as the high point of the program. Robert A. Aronstam '02 said that he felt "definitely more relaxed going into O." The goal of FLP was to foster "leadership, not in the traditional sense but taking responsibility within your community," said Elsie Huang '00, one of the FLPleaders. Another goal of FLP, Huang said, was "for freshmen to meet and interact with freshmen so that once residence selection is complete there will be bonds across living groups." Huang, incidentally, called the cross dressing "disturbing."